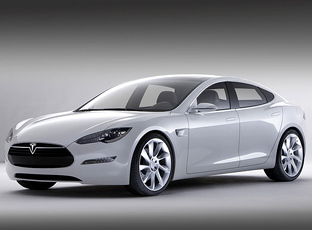 The Tesla Model S, which is due to go into full production at the end of 2011, is an all-electric powered luxury saloon with a versatile and practical interior. 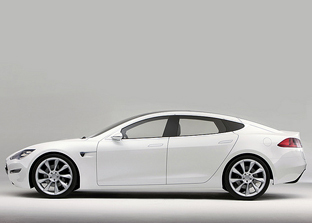 With a 300-mile range and 45-minute QuickCharge capability, theTesla Model S can carry five adults and two children in quiet comfort. Charges can be made from a 110V, 220V or 440V outlet and Tesla are working with the US government to set up charging stations at various locations. 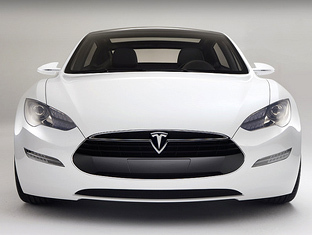 The drivetrain of the Tesla Model S includes a liquid-cooled 9-inch motor, floor-mounted battery pack and a single-speed gearbox, delivering smooth, continuous acceleration. The electric motor allows for a highly impressive 0-60 mph sprint time of just 5.6 seconds. The top speed is 120 mph. Designed by Franz von Holzhausen, the car's aggressive stance gives way to a modern silhouette, with minimal front and rear overhangs for maximum space efficiency. 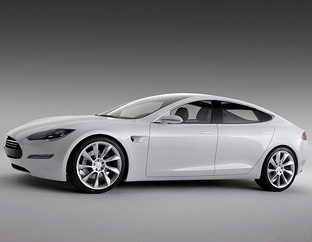 The car's mature face defines the future of the Tesla brand and incorporates the touches from the Tesla Roadster. Environmentally friendly materials are incorporated throughout, including water-based paint for the exterior, chrome-free vegetable tanned Italian leather on interior, and 100 percent recycled PET plastic carpeting from Futuris. 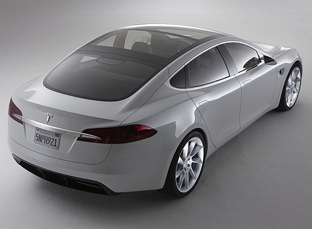 Other high-tech features of the Tesla Model S include a panoramic glass roof with sliding moon roof, permanent 3G connectivity with Internet, HD and satellite radio, 17-inch touchscreen display housed in the center console and a fully digital instrument cluster.